Yet another page of shame has been written in the history books of a student union in the UK. 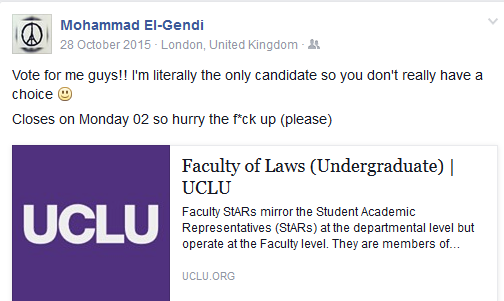 This time it was UCL or UCLU (University College London Union). On Tuesday 8/3/2016, a mob of rabid, semi-ignorant, hate-filled ‘red fascists’ assembled together to play ‘government’. One of the motions tabled (unsurprisingly, given the make-up of the council), was to decide whether or not to support the boycott of Israel. Israel is a touchy subject amongst student unions these days. Time was, that the tiny Jewish state, surrounded by blood thirsty despots like Nasser, Saddam Hussein, the Ayatollah & Gaddafi could count on students to easily differentiate right from wrong. Today, with talk of the Zionist run USA or Mossad being behind ISIS and 9/11 only too common in certain student quarters, all semblance of moral order has been lost. Israel, whilst still the target for every radical Islamic nutcase in a region that never runs out of them, has somehow become the cause of everything that is wrong in the student world. No doubt Netanyahu, seeing as ‘Zionists’ control the US, UK and the banks, is also responsible for raising university fees. Think of a nasty accusation and place it before the word Zionist. They all work. ‘Racist’ – easy, ‘Ethnic Cleansing’- but of course, ‘Genocide’ – sure, even ‘Apartheid’ works, all placed on the only liberal country in the entire region where everyone has a free vote. Funny how some UCL students wouldn’t even be allowed to enter cities in Saudi Arabia because of their religion, yet that issue fails to bother a student union council that clearly isn’t working to an agenda about ‘universal’ human rights. To deal with the claim that the student union vote was actually about human rights. Let’s just look at the central force behind the #BDS motion. 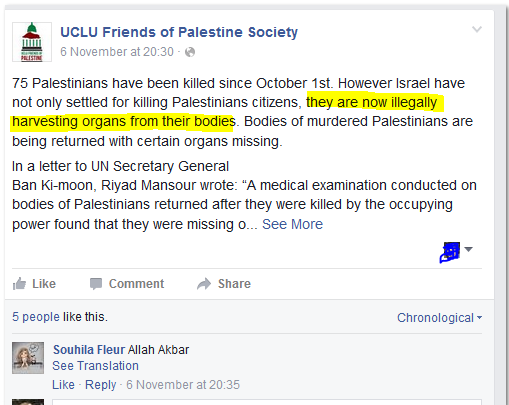 UCLU Friends of Palestine Society. This from last years ‘Activities Officer’ Katba Imansouren: She was meant to be representing ‘all students’ when she made this ‘call to arms’. Now I wouldn’t want to be presumptuous, but I doubt that the student body at UCL would want to engage in a Holy War to save Al Aqsa. But what is clear from the post (that is devoid of all talk of human rights) is that there is a religious angle being played here. 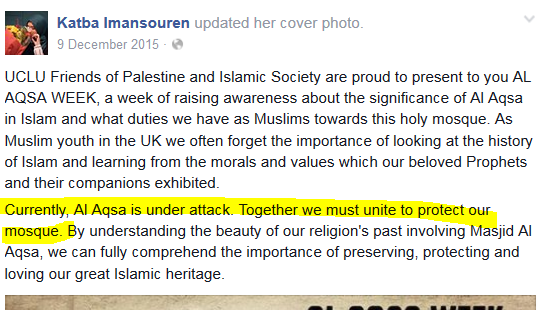 Al Aqsa is under attack – ‘we must unite’. Hands up everyone who believes this argument wasn’t used at the #BDS vote. Just in case anyone wishes to imply that sentiment wasn’t a central theme: Just 4 months ago, UCLU had an entire week dedicated to this specific cause. 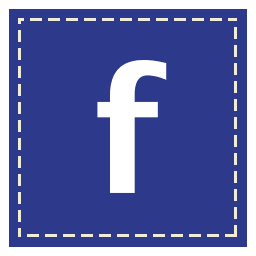 This is a post from the UCLU FOPS . This takes it even further. It asks what can be done as an ”ummah’, to protect and defend Al -Aqsa. 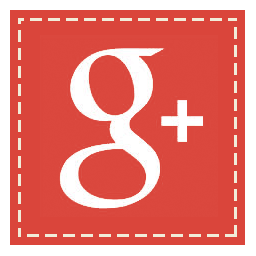 Wiki translates ‘ummah’ as ‘the collective community of Islamic peoples’. Perhaps the cynical answer to the question would be: ‘get elected to the student union and then vote to boycott the Jews’. After all, it is rather coincidental that Al-Aqsa mosque just happens to be inside the same nation they want the student union to boycott. I think that has to be read two or three times to be believed. Did I mention that Hamas are a radical Islamic group? And did I point out Hamas ‘represents the Arab-Israeli conflict as an inherently irreconcilable struggle between Jews and Muslims‘. 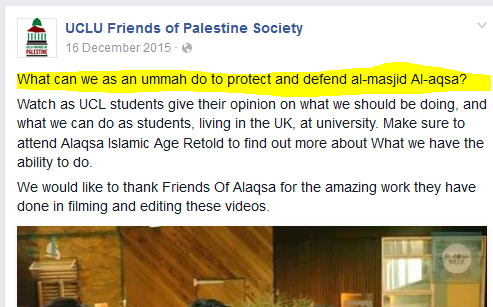 Perhaps the intention is that they will unite with UCLU FOPS to save Al Aqsa. Remember, this society is the primary force *behind* a vote that seeks to boycott the Jewish State of Israel for ‘humanitarian reasons’. Like most pro-Palestinian groups, even when they push the conflict onto their groupies, they choose to push little more ‘than a regurgitation of the vilest antisemitic charges of the past millennium‘. And there is more. Remember Saladin? Saladin Al Ayoubi? I am a fan of history, and great men forge their own path and change the face of the planet on which they walk. Saladin was a great man. Unless of course the Friends of Palestine call for #BDS isn’t actually one of universal values at all. The issue isn’t that members of this group have these beliefs. They want to protect the Mosque in Jerusalem (read- keep filthy Jewish feet out), and believe it is the duty of the ‘collective community of Islamic people’ to defend it. They think the radical Islamic terror group Hamas is some kind of model army. They use the man who waged holy war and created an Islamic empire as a role model. I have no problem with anyone’s belief. I do however have an issue when they hide the truth and push a lie to deceive all around them. More so when the target is Jewish. This is not a humanitarian argument, nor is it interested in truth. Let’s be honest, this is not how they pushed the case for #BDS at the vote. So let us move onto the next issue – how have these few activists made this ‘religious war’ against Jews a UCLU issue? Simple, they did it by skewing and abusing the democratic process. Except they didn’t think it necessary. This bunch decided they were ‘representative enough’! So let’s walk down the ‘democratic’ angle. After the celebratory postings following the successful passing of the motion, Ariel Tamman, co-president of the Friends of Israel Society, said anti-Israel activity had become more “invasive” and Union of Jewish Students Campaigns Director Russell Langer told Jewish News the decision was “extremely disappointing” and “completely undemocratic and unrepresentative”. Addressing the ‘undemocratic’ claim, Israel hating Ben White, an ever-present figure at every #BDS party, and one of the UK BDS campaigns poster children, wrote an article in Middle East Monitor that responded: ‘UJS did not elaborate on how a decision made by elected student officers was ‘undemocratic’. So as Ben has a difficulty understanding what democracy means, let me help him out. ‘Although this year was marketed as the ‘Big Vote’ by a Union desperately attempting to get students interested in University Politics, the elections for 2016/7 were nonetheless disappointing and dismal. This isn’t democracy, and it is important that these students understand it. Their freedoms, especially those from minority groups, are dependent on people given the responsibility of office behaving in a manner directly opposite from the way these activist officers have done. People in office make laws. How would our nation look if every small group used and abused the system so as to get away with ‘what they can’, rather than actually deal with issues in the wider community they were voted in office to represent? What if they failed to take into consideration that minority groups needed protection too? That isn’t democracy it is majoritarianism (understand now Ben?). Sniggering and plotting amongst themselves about which of their own personal little hatreds they can enforce on everyone around them. And when the vote passes – high fives all round. How vile. I don’t even care that for some of them, fighting for Al Aqsa is a reasonable cause. What shouldn’t be allowed is bringing this argument onto campus. They have clearly done so, however much these individuals may protest this is not the case. This is what this nasty little mob did. They saw an opportunity and took it. Rejecting a more democratic option, they chose to force through a cause that ‘religiously’ several of them identify with. In doing so this minority enforced the engagement of Muslims and Jews on a UK university campus in a conflict that neither seeks, and ensured also, the remaining students took sides with them. They got away with it because they know the jargon and ‘cleanse’ the argument prior to a vote to make sure only humanitarian arguments are expressed. Then, supported by a few red fascists who either don’t care, were duped into believing this was a humanitarian cause, or have an issue with Jews themselves, they voted that the entire student union should go ahead and enforce a boycott on the Jewish State. The rest of the UCL student body, whatever their belief, has now been gathered together to unite in the fight to save Al Aqsa mosque. This is not the face we want for London in 2016. The students of UCL need to, have to, put this wretched little mob back in its place. As always another stunning piece from you. I learn so much from your comments because you have a gift of being able to express extremely complex issues [that are outside of my knowledge] with clarity and ease. David, by eliding Israel and Jews so completely (such as to describe a boycott of Israel as a boycott of Jews – even though as far as I’m aware, UCLU continues to have Jewish members, a Jewish society, a willingness to do business with Marks & Spencer etc. etc.) you are only providing fodder to those anti-Semites who seek to do the same (such as by vandalising my local synagogue with a sticker saying ‘Child Murderers’). Please stop. Disclaimer for those who will read the above and blindly accuse me of supporting BDS: I don’t support BDS. UCLU is stupid to have adopted such a policy. It’s divisive and a barrier to peace and when I was a student I engaged in anti-BDS campaigns on campus. Gabriel. In your world, all anyone has to do is switch the word ‘Jew’ for ‘Zionist’ to be beyond the reach of accusations of Jewish hatred. It is a weak, pointless and baseless position to hold. Not everyone who dislikes Israel is engaged in Jew hatred, but BDS as a vehicle, wouldn’t be able to move without it. This was a particularly dirty episode, moreso because UCLU FOP can hardly claim to be interested in human rights. As a side note. I speak to 100’s of BDS activists. They think I am not Jewish. Given you cannot partake in the type of conversations I engage in, how do you know what these people want and they don’t want? 1. 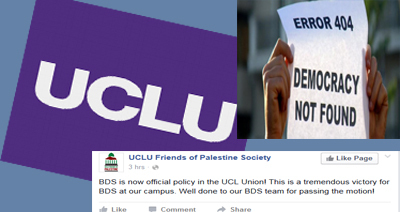 If UCLU now ‘boycotts Jews’, how come they continue to have Jewish members and a Jewish Society and do not boycott businesses owned by British, American, French, German, Russian etc. Jews? 2. If Jews are so precisely correlated with Israel that a boycott of Israel equals a boycott of Jews, was it anti-Semitic for the ‘Child Murderers’ placard to have been posted on a London synagogue, and if so why? Gabriel – your post is a bit of a strawman TBH. UCLU doesn’t boycott Jews, they are not allowed to and there are laws in this country that would stop them from even tabling such a motion. I would also imagine that even many of those in the council would be horrified at the idea. Whilst you were reading what you wanted to in my blog, did you also read this bit “In doing so this minority enforced the engagement of Muslims and Jews on a UK university campus in a conflict that neither seeks”. Have you ever heard a non-racist person make a racist statement? You have to differentiate between the person and the action. However there is little doubt (given the content of their own posts), there *is* a religious and even violent angle to this. The ones making the posts are Muslim, the ones holding Al Aqsa are Jews. Who do they want to boycott? Or put it another way. 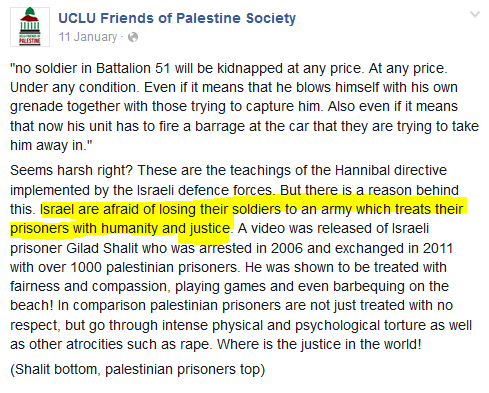 If Nasrallah was ‘occupying Jerusalem’ would UCLU have passed a boycott motion a few days ago? Would there even be a Palestinian here on scholarship to vote for it? Finally I don’t precisely correlate at all – you have things backwards. Please David do not use the shield of anti-semitism to protect Israel. Israel must be exposed. Their war crimes must be known to all people. Some Israelis tried to persuade Israel allies to put pressure so they are obliged to sit in the negotiating table and deliver real (not fake)peace. The problem in the Middle East is the fact that Israel is too strong to sit and negotiate. Why must they and nobody pressures them to do so. Your game of anti-semitism unfortunately will not foul us. Not because anybody is a jew then he or she can commit crimes and be above the law. Unfortunately Israel has been above all laws for so long. But time will definitely come to pay for this. I always believe in justice. Sorry to tell you that you are wrong and we do respect jews and their religion. Our problems is the Israeli politicians and the their crimes. I hope you grow out of the anti-Semitic shield and stand outside and face us. It is sad that our British government has been persuaded to apply undemoratic rules forcing private businesses to trade against their wells. This is the real cause of what is happening in all universities. But it seems you want to force your ideas and laws against people. If Israel respects international laws then no one would have objected to trade and relate to it. Thank you for responding. 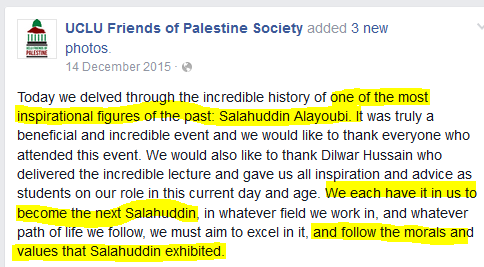 And thank you for bringing up the ‘keyword’ of the Palestinian cause ‘Justice’. Unfortunately your accusation is a rabbit hole. I protect Israel because (in the main and at the root) Israel is right. So let’s side-step the false image that I am somehow defending the indefensible under a banner of antisemitism and deal with basics. 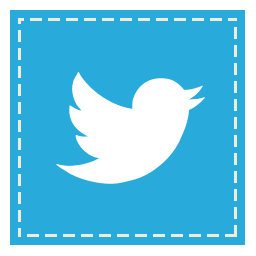 Let us take a boy who is 9 years old and living in the camps of Lebanon. He was born there. Why is Israel responsible for his suffering? His parents were also born in Lebanon and have also lived all their lives there. Why is Israel somehow responsible for the oppression they have faced all their lives. Or if you wish to answer in a different way. The boy born in Calais today. Who is responsible for his wellbeing? Who should we petition to make sure his human rights are observed? If he is mis-treated, who is to blame? Do you think that in 70 years his grandchildren will be born in a camp in Calais? What nationality do you think his grandchildren will be? When you use the word ‘justice’, people over in the UK hear their word ‘justice’, but in reality these are two completely different words aren’t they? My wife, whose father was expelled from Egypt in 1956 without a penny and who was forced to hand over the family business to the Egyptian government. The man who now lives inside Israel and is called Israeli. Is he mentioned in the calls for #BDS #justice anywhere? If not, why not? According these disturbed Students, the British Army better send out it’s troops to defend al Aqsa before it is to late. Poor Britain. Their once prestigious Universities have degraded into war rooms. These students are so stupid, ignorant and cowardly they can only utter nonsense. One cannot expect sense from a fool. Maybe they grow up or end up beggars on the street, they are not Worth our attention.